What is a hernia? A hernia is a protrusion of a portion of an organ into the surrounding muscle or structure that contains it. The most common type of hernia is an inguinal hernia, which is located in the groin, and it can affect both adults and children. Many people don’t experience symptoms so they don’t know they have a hernia. Most hernias are not life-threatening, but they do not go away on their own. Hernias require surgical treatment in order to correct the problem and prevent potentially dangerous complications. Finding out "what is a hernia" starts with symptoms. Not everyone who has a hernia will experience symptoms, though as time passes symptoms will begin for the hernia gets worse. An asymptomatic hernia may be detected through a routine medical exam. The most common symptom is a lump in the affected area. The lump may appear through straining, such as coughing, lifting heavy objects, or with pregnancy or obesity. A dull ache may be felt in the affected area, though hernias are generally not painful. Other symptoms can occur depending on the location of the hernia, such as weakness or pressure in the abdomen. A hiatal hernia can cause acid reflux, difficulty swallowing, or chest pain. There are some potentially dangerous complications associated with a hernia if it is left untreated for too long. The bulge can become trapped by the muscle causing pain and discomfort. Strangulation can occur, reducing the blood flow to the area causing the bulging portion to become infected and possibly die. If a portion of your intestine is trapped, the bowel can become blocked, causing constipation, pain, and nausea. Warning: If you suspect you may have a hernia, contact your doctor right away to make a definite diagnosis and plans for your treatment. Observe your conditions closely and alert your doctor if the symptoms change or worsen. Causes is the crucial part in finguring out "what is a hernia". Actually, there are some common causes of all hernias, such as some kind of pressure combined with an opening or weakness in the muscle surrounding the organ affected. It can happen at birth, but typically occurs later in life. It can be caused by anything that leads to straining or pressure, including lifting heavy objects, persistent sneezing or coughing, or chronic diarrhea or constipation. Other factors that can weaken the area include smoking, obesity, and poor nutrition. Inguinal hernia: This is caused when the bladder or intestine pushes through the abdominal wall or into the inguinal canal in the groin. This is the most common type, occurring mostly in men due to a natural weakness in this location. Inguinal hernias make up 96% of all hernias. 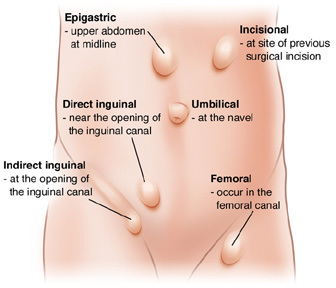 Incisional hernia: This occurs when the intestine pushes through the abdominal wall at the site of a previous surgery. This is seen more commonly in the obese or elderly due to inactivity after abdominal surgery. Femoral hernia: This is seen most often in women, especially when pregnant or obese. A femoral hernia occurs when the intestine protrudes into the canal where the femoral artery is located. Umbilical hernia: Commonly seen in newborns and in obese women who have given birth to many children, an umbilical hernia occurs when the small intestine protrudes into the abdominal wall near the navel. Hiatal hernia: This can be a painful condition in which the upper part of the stomach protrudes into an opening in the diaphragm where the esophagus passes through, called the hiatus. Women can get hernias, but men are more prone due to a natural weakness in the groin area. You are more at risk over the age of 35 due to a natural weakening of the muscle tissue. Weakness in the muscle tissue can run in family, so this can increase your risk if a relative has hernia. Being overweight or obese or lifting heavy objects can put stress on the muscle tissue, weakening it. Being frequently constipated or having a persistent cough can cause strain which can lead to hernia. Smoking can have an adverse effect on the body’s ability to produce enzymes that lead to cell growth. This weakens the muscle tissue over time. A sports injury or accident can tear muscle tissue in the abdomen, leaving an opening or weak area. You can also be born with a weakness in the muscle. After we know how to treat hernia, we will have the last piece of the puzzle "what is a hernia". If you notice symptoms of hernia, contact your doctor, especially if the hernia is causing pain or discomfort. There are some natural remedies and medical treatments that can help relieve and get rid of the symptoms. Your doctor may advise you to wear a truss to push the protrusion back out of the muscle and pain relievers can ease any pain or discomfort, but ultimately surgery is the accepted treatment for hernia. The hernia surgery can reposit the protrusion and remove any dead tissue due to strangulation. The hole is then repaired with tissue or a synthetic mesh patch. The herniorrhaphy is laparoscopic surgery in which a thin telescope-type instrument is used. It requires smaller incisions than conventional surgery and less recovery time. It is usually done as an outpatient procedure under local or general anesthesia. Regular activity can be resumed within two weeks, there are typically no dietary restrictions, and complete healing takes on average about four weeks. But you will not be able to do any heavy lifting for at least three months following the procedure. Natural remedies may help ease some pain or discomfort associated with hernia, but they do not solve the problem. Here are some remedies you can use to ease your symptoms. Try acupuncture. This stimulates certain pressure points and can ease pain or discomfort. Do proper exercise. Regular exercise strengthens the abdominal muscles and helps get rid of excess body weight which puts pressure on areas of hernia. Avoid any heavy or strenuous exercise. Use ice compresses. Regular application of ice to the area can ease swelling and any pain or discomfort. Adjust your bed. Elevating the head of your bed by about six inches can prevent stomach acids from moving up the esophagus but avoiding using pillows that can put stress on the abdomen. Maintain a healthy diet. A healthy diet that includes fiber and protein will ease intestinal problems that can cause pressure in the abdomen and help you shed excess weight.